I like to blog about funny things that have happened and of course Italy, because if you cannot laugh at Italy you end up crying. But today’s post is a little different. I got caught by a phishing e mail or I hope nearly caught. I don’t normally fall for spam e mails but this one was clever. When I received the e mail. I went and took a look at the website http://www.adp.com. The website looks OK I then decided to click on the e mail link. DUH!! The reason I clicked on it was, wait for it.. I wanted to see if they would ask for my bank password etc if it did I would be 100% sure it was some sort of scam, rather than 95% sure. The link took me to a blank website with a tiny box with the words connecting. I immediately unplugged the internet cable and started my virus scan. 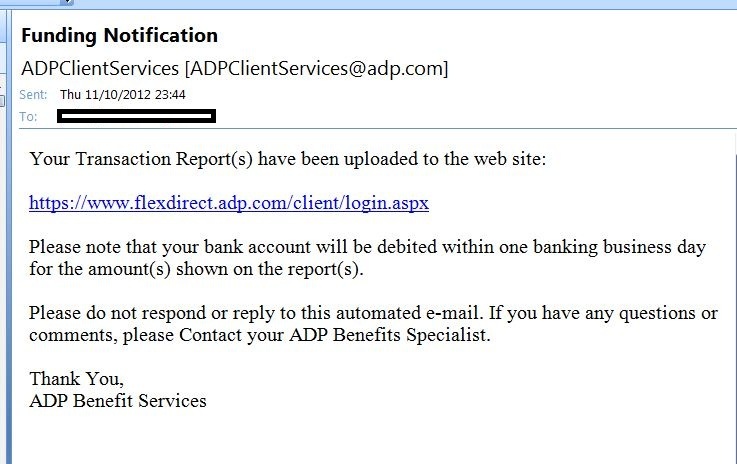 Later I did an internet search for ADP Client services scam / spam. To be honest I should have done this first rather than clicking on a link that I was pretty sure was spam. The search pulled up this website http://blog.mxlab.eu/2012/06/28/emails-with-subject-adp-funding-notification-debit-draft-are-a-security-risk/ a WordPress site dedicated to E Mail security risks, Bless them. I have run my virus scanner and nothing was found, but at the back om my mind I am still a tad worried. Uffa! !